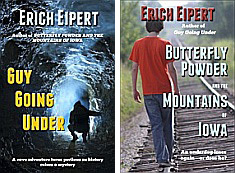 A cave adventure turns perilous as history raises a mystery. See reader reviews of Guy Going Under at Amazon. Guy Toulouse is an unmotivated high school student obsessed with his self-image and a girl out of his reach. When he flees to the Olympic Peninsula of Washington State to escape his troubles in Seattle, he doesn’t expect to encounter a dangerous gangster, a mystery surrounding 16th-century European buccaneers, and a hidden cave with a grisly history. Nor does he expect to discover a connection between the historical mystery and a recent unexplained death. Or to become trapped underground with a too-smart girl he dislikes. In order to survive, he needs to call on resources he didn’t know he had and re-think what—and who—is important to him. The trouble is Guy doesn’t know if he is up to the job.